Compunetix is a proud supporter of the Pittsburgh technology landscape, actively participating in local high school robotics programs and in groups such as the Pittsburgh Technology Council and the University of Pittsburgh Department of Computer Science. Pitt is currently planning a groundbreaking new event for Friday, January 30 through Sunday, February 1. 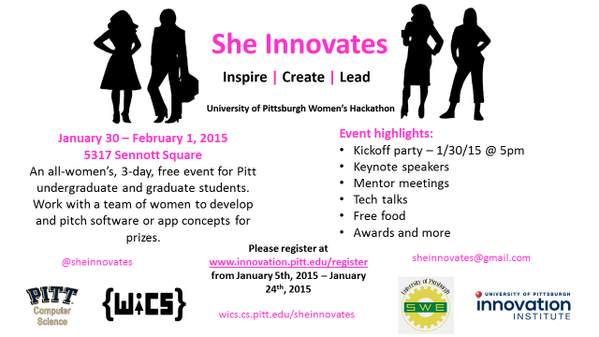 She Innovates is the first all-women’s hackathon at the University of Pittsburgh, and the ladies of the Compunetix training, engineering, and marketing teams will be in attendance acting as mentors for the hackathon participants. Mentors will be able to offer advice, tips, and answer questions along the way. The hackathon will be held in the Sennott Square building on the 5th floor in room 5317 and the surrounding classrooms. On Sunday, February 1, each team will pitch their ideas to a panel of judges and prizes will be awarded to the winners. For the full schedule of events or to register as a volunteer, click here. Best of luck to all of the hackers!